I don't care what anyone says, there’s nothing more comforting or satisfying than a bowl spaghetti. What makes this spaghetti special is the roasted garlic. I might be a bit obsessed with putting roasted garlic in everything i make for this blog (exhibit a, exhibit b), but it's silly easy and it was meant for pasta. This recipe is like the pasta you had everyday during college, but grown up. Because you're grown up, so let's act like we're kind of like it this time. Plus you deserve this one. Start by pre-heating the oven to 400 degrees fahrenheit. Roast the garlic by creating a foil pocket, wrapping up the garlic cloves with some olive oil + dried basil (if desired) in the foil. Put this in the oven for ~40 minutes until soft. Meanwhile boil your spaghetti according to the directions on the package. You'll want the spaghetti to be a bit past al dente. Drain the pasta. 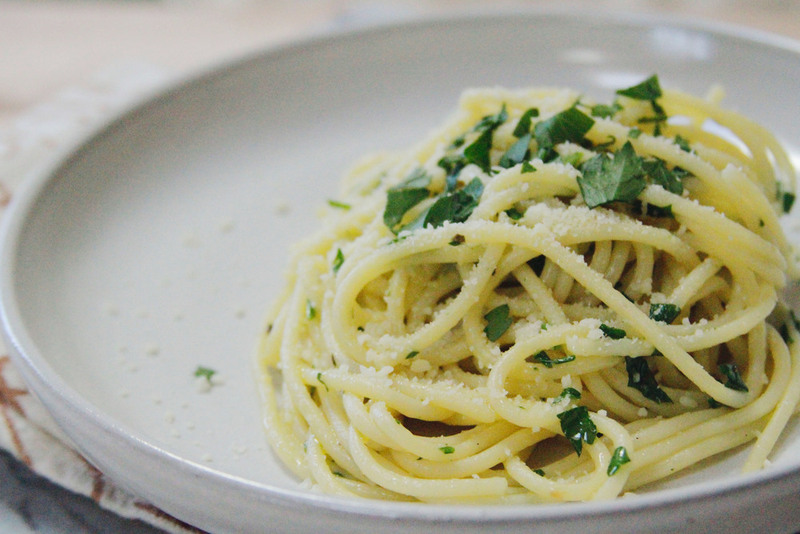 heat up three tablespoons of olive oil + 1 tablespoon of butter in the same pot you boiled the spaghetti. add the contents of the foil packet + pepper flakes. Stir to combine. add the spaghetti back into the pot. add the lemon juice + fresh parsley. combine again, then enjoy with freshly grated parmesan cheese.